American rabbi; born at Trencsen, Hungary, July 30, 1825; died March 18, 1897, in New York city. He received his education at the yeshibah of Presburg, and in 1863 was called as rabbi to Koritschan, Moravia, which position he in 1866 changed for that at Warasdin, Croatia. In 1873 he was called to Brooklyn, N. Y., where he officiated in the Congregation Beth Elohim, and later in the Congregation B'nai Abraham. He wrote: "Drei Predigten," Warasdin, 1868; "Die Sprache der Wahrheit," ib. 1870; "Miḳraot Ḳeṭannot," Cincinnati, 1892. The last work is a presentation of the 613 commandments with their Biblical bases, their rabbinical definitions, and their moral lessons. He also contributed very frequently to "Deborah." 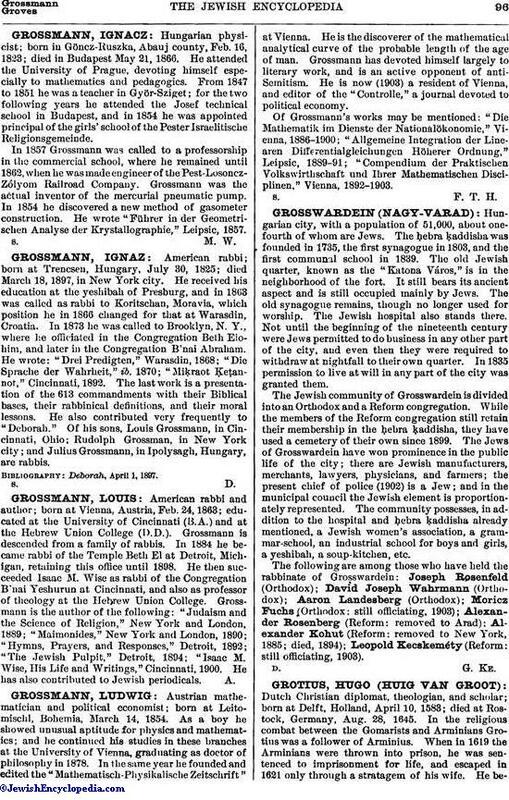 Of his sons, Louis Grossmann, in Cincinnati, Ohio; Rudolph Grossman, in New York city; and Julius Grossmann, in Ipolysagh, Hungary, are rabbis.